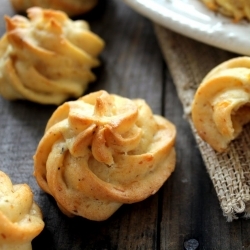 I've been having lots of fun with choux. 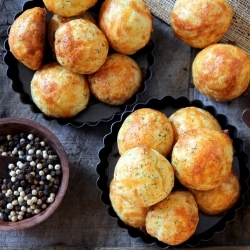 In a few days I'll even have another choux recipe to post: rosemary parmesan gougères! and maybe another after that because now that I'm looking at these lovely foods I might need more.....and since I'll be at butchie's tonight maybe we will warm her kitchen with some eclairs. That should happen. That should always happen. For the first -ime cream puff maker: take your time. If you have the time to make everything all at once I'd like to know your secret for time management. Please teach a seminar. I made the choux on one day, the pastry cream the next, and the assembly was on the third day...right before the party....I was a wee bit frantic but even then, for me it was easier to find half an hour or so each day, than two hours all together. I bet you know the feeling. Transfer the dough to a pastry bag with a half inch tip (or a disposable bag with the tip cut off) and pipe tablespoonfuls onto the baking sheets at least two inches apart. The puffs can be frozen or refrigerated. To reheat, cook in an 350 degree oven for at least five minutes, or until piping hot and crisped. Meanwhile, in a stand mixer add the cornstarch and sugar. Whisk to combine. Put pastry cream into a pastry bag with a sharp end that will be able to pierce through the top of a choux pastry puff. I used a disposable plastic pastry bag. Pierce into top of each pastry puff with the tip of the pastry bag and squeeze bag, thus filling the puff with pastry cream. You should see the puff slighly expand as it becomes full. 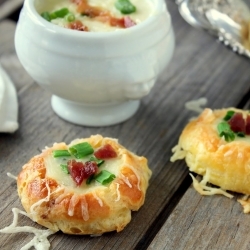 Place filled puffs aside on a tray and continue to fill each pastry puff. Once all puffs are finished, place tray of puffs into the freezer. This allows the cream to freeze slightly so that it will not leak into the chocolate glaze while dipping. Dip the top of each cream puff in the chocolate glaze, covering the hole made for the cream filling. Place right side up on a tray. Return trays of dipped puffs to the freezer for the chocolate to set.